More than 500,000 devices such as prosthetic valves, pacemakers and implantable cardioverter-defibrillators are implanted into cardiac patients every year in the United States. While providing clear benefits, these procedures carry a risk of bacterial infection. To detect such infections, Emory researchers have been exploiting the chemical properties of maltohexaose, a sugar that is taken up by bacteria, but not mammalian cells. Maltohexaose-based imaging probes could be used to detect infections associated with cardiac and also orthopedic devices, they say. Assistant professor of medicine (cardiology) Kiyoko Takemiya, MD, Ph.D. and cardiology division director W. Robert Taylor, MD, Ph.D., together with professor of radiology and imaging sciences Mark Goodman, Ph.D. and colleagues, recently published their findings on in JACC: Cardiovascular Imaging. "If device infections can be detected early, before extensive inflammation or loss of skin integrity, it may permit preventive treatment by antibiotics and avoidance of sepsis or additional surgeries," Taylor says. 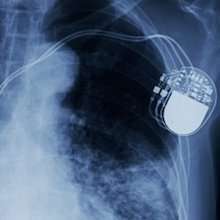 "The impact on morbidity and mortality associated with infected medical devices could be very significant." "This represents important progress in the field that has eluded clinicians and radiologists for half a century," says part of an editorial accompanying the JACC: Cardiovascular Imaging paper, from Mohammad Sajadi, MD and colleagues at the University of Maryland. Taylor is Executive Vice Chair of the Department of Medicine at Emory University School of Medicine and director of the Division of Cardiology. He is also part of the Wallace H. Counter Department of Biomedical Engineering at Georgia Tech and Emory University. Goodman is program director for Emory's Center for Systems Imaging and director of the Radiopharmaceutical Discovery Lab. Maltohexaose, a chain of six glucose molecules, is a form of maltodextrin, a breakdown product of starch used as an additive in beer, peanut butter and packaged snacks. Its chemical derivatives are likely to have minimal toxicity in the body. Takemiya developed two probes. One links a fluorescent dye to maltohexaose, for detection close to the skin by hand held near-infrared imaging devices. A second puts a radioactive fluorine tracer on the sugar, permitting detection deep in the body through PET (positron emission tomography). Takemiya tested the probes in rats with local skin infections by Staphyloccocus aureus, a common source of device-related trouble in humans. Stainless steel "mock ups" were used as model devices. Using a radioactive maltohexaose probe, the researchers were able to distinguish bacterial infection from non-infectious inflammation by an irritating agent, unlike imaging with FDG (radioactive glucose). "In our experiments, we intentionally performed the in vivo studies using a very mild degree of infection to mimic a preclinical infection," the authors write, adding that the animals had no local or systemic signs of infection. The researchers also showed that the maltohexaose-based probes could detect bacteria that were grown in a biofilm and then placed on the mock-ups. Taylor says the probes could also be useful for situations such as infections associated with orthopedic implants, or unexplained pulmonary infections. Currently indirect assessments of infection are necessary, such as blood tests, instead of direct visualization of bacteria. An Emory team is planning the first in human clinical trial, using the PET-based imaging agent, with colleagues in nuclear medicine, orthopedics and infectious diseases, he says.